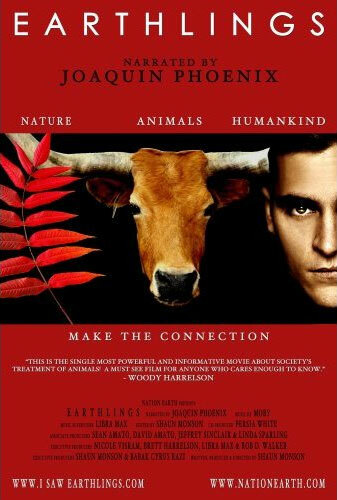 Narrated by Academy Award nominee Joaquin Phoenix (WALK THE LINE, GLADIATOR), EARTHLINGS is a feature-length documentary about humankind's absolute economic dependence on animals raised as pets, food, clothing, entertainment and for scientific research. Using hidden cameras and never-before-seen footage, EARTHLINGS chronicles the day-to-day practices at some of the largest industries in the world, all of which rely entirely on animals for profit. Powerful, informative and thought-provoking, EARTHLINGS is by far the most comprehensive documentary ever produced on the correlation between nature, animals and human economic interests.